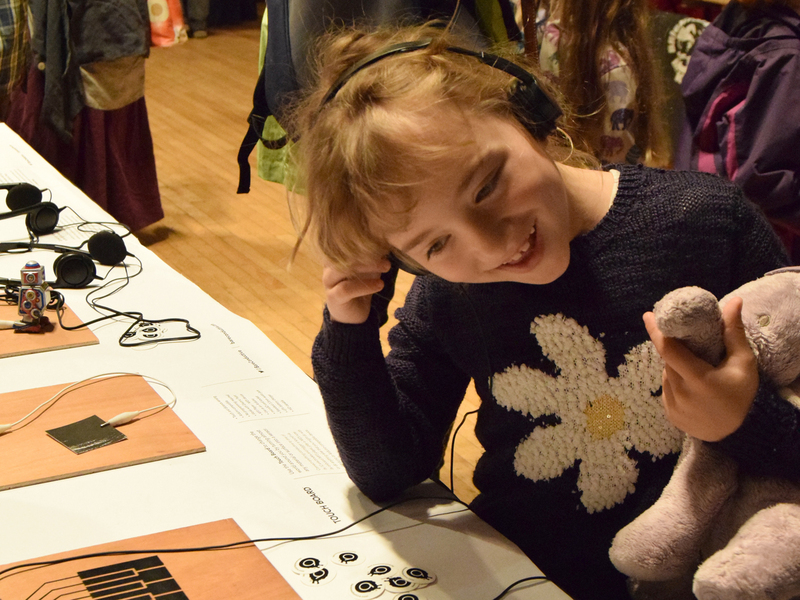 This year’s Brighton Mini Maker Faire was produced on somewhat of a shoestring, with reduced funding available both from public grants and from private sponsorship compared to some previous years. Despite this we were able to produce our core event (minus a few bonuses) and attract a wide range of makers from many and varied fields through a focussed production effort and the benefit of word of mouth from our previous four events. 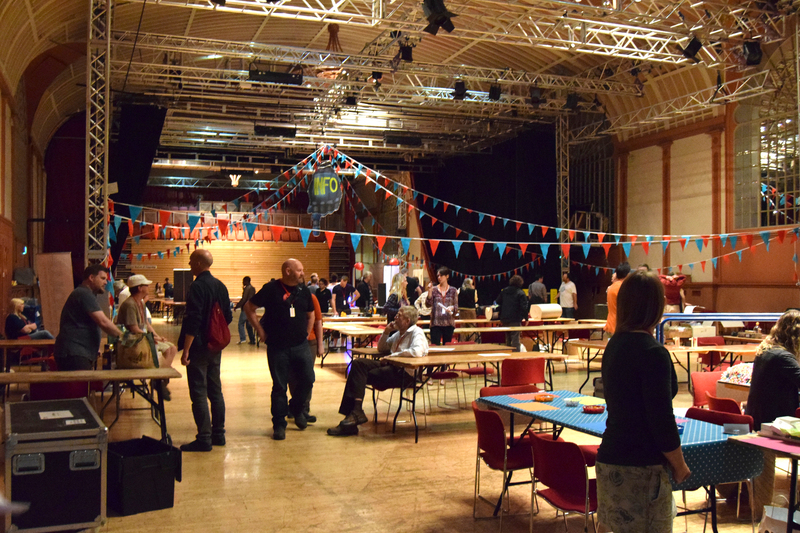 BMMF is a single-venue maker faire that’s been based in the Brighton Dome since its first annual event in 2011. We make use of a few different areas within the venue: this year the main exhibition of maker stalls and drop-in workshops was again in the Brighton Dome Corn Exchange, a large open space with a capacity of around 1000 people; long-form pre-bookable workshops took place in the smaller Founders Room which fits around 50 people seated; and we also had makers dotted around other public spaces, corridors and landings throughout the rest of the building, which provide handy quiet or dark areas for makers with specific AV requirements. The only ticketed area was the Corn Exchange – visitors could wander around the other spaces free of charge and could also attend the long-form workshops without a ticket for the maker faire, which has been a big help in previous years when there’s been long queues to get into the main exhibition area. We increased ticket costs this year by £1 to help cover some of the shortfall in funding: advance tickets were £7 including booking fee (sold via Eventbrite) and tickets on the door were £9. Children under 16 got in free and parents were also able to pre-book free child tickets on Eventbrite in advance. We offered a pay-what-you-can ticket option on Eventbrite for several weeks before the fixed-price advance tickets went live as we were concerned that the fixed-price ticket costs may be prohibitively expensive for low-income families. This is the first time we’d experimented with the pay-what-you-can model, and the average ticket payment for pay-what-you-can tickets ended up actually being more than the later fixed-price ticket cost, at £8.22 per person. The lowest amount paid was £1 and the highest was £20. Unfortunately we don’t have any data on whether the pay-what-you-can model made the event more accessible or enabled a more diverse audience to attend: we’re considering collecting attendees postcodes in future to get a better idea of this. We also offered an additional donation box on Eventbrite which generated just over £200 in donations on top of fixed-price ticket payments. There were an estimated 1900 total visitors this year, with 981 tickets sold or pre-booked in advance (just over 50%). We don’t have accurate figures on the total ratio of adult and child visitors (under 16-year-olds), but the ratio for advanced ticket sales / pre-bookings of free child tickets was 57% adults and 43% children. This year we had around 134 makers exhibiting on 61 stalls. 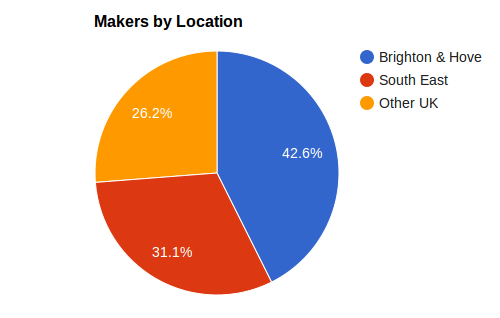 Out of those 61 stalls, 26 (43%) were individuals or organisations from the local Brighton & Hove area, 19 (31%) were from other areas in the South East, and the remaining 16 (26%) were from elsewhere in the UK. We didn’t have any makers from abroad this year :(. The furthest distance travelled by one of our makers was 462 miles (well done Ada from Glasgow!). 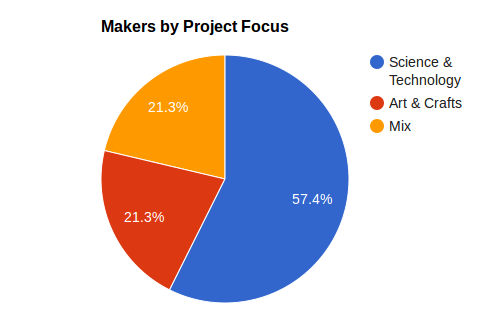 In terms of project types, 35 stalls (57%) were primarily science and technology focussed, 13 (21%) were primarily arts and crafts focussed, and another 13 (21%) featured a fairly even mixture of both. 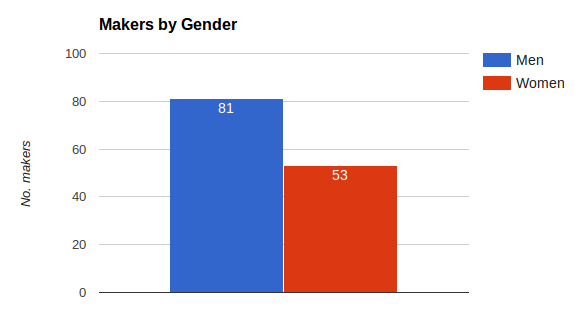 There was a gender division of approximately 60% male makers (approx 81) and 40% female makers (approx 53). However, when cross-refencing this data against project types the divisions become much more pronounced. 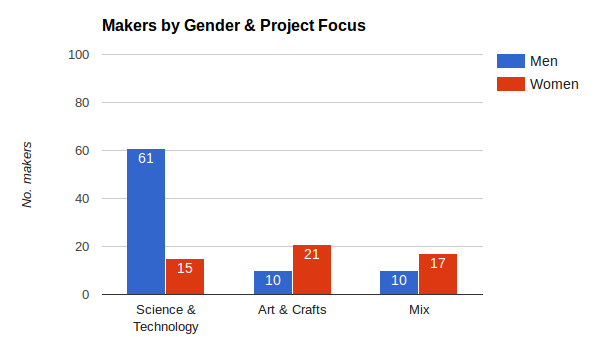 Science and technology stalls featured approximately 61 men and 15 women (a 1:0.25 ratio); arts and craft stalls featured approximately 10 men and 21 women (1:2.1); and stalls that combined technology and crafts featured approximately 10 men and 17 women (1:1.7). I considered doing some analysis of the ratio of makers from for-profit companies, not-for-profits and CICs, clubs and community groups etc but we don’t have enough information available to be able to figure this out in a lot of cases. The number of stalls exclusively promoting or selling products were fairly low as we try to encourage projects that promote the show-and-tell maker faire ethos. We welcomed back Maplin, Bare Conductive and O’Reilly who all had stalls at the faire promoting and selling products for the maker community. We welcomed onboard a new headline sponsor, Yelp, who were interested in reaching out to the UK maker community to promote their business review site (massively popular in the US). We also had sponsorship support from two of our makers, MakerClub – who unfortunately had to drop out of the faire due to staff availability – and Just Add Sharks, whose owners are BMMF veterans having now attended all five faires! Commercial makers who were primarily promoting and/or selling products on their stalls were also asked to pay an exhibition fee of between £50-100 to help keep the maker faire sustainable. For various reasons this year’s faire again didn’t feature a conference strand: although it was well received when it ran in the Founders Room in 2012 and 2013 it takes a lot of man hours to organise plus a budget for paying speakers, neither of which we had much of this year. We’ve also seen an increase in the number of maker applications over the past couple of years so space has been at a premium and the Founders Room has been used for housing workshops and maker stalls that we wouldn’t have room for in the main exhibition area. This year we also cut a couple of bonus features: our “Hot Glue” maker faire zine and our visitor and maker survey programme. The surveys have been immensely useful in helping us iron out logistical issues over the past few years but again they take a huge amount of time in collecting and analysing the survey data. We unfortunately weren’t able to offer grants for makers this year due to our budget restrictions, as we preferred to spend the available money that we had on perks that would benefit all of our makers: we held a set-up party on the evening before the faire so that people could get their stalls sorted out before the inevitable craziness that ensues on the day, and to give everyone an opportunity to chat to their fellow makers and enjoy some pizza and beer (and soft drinks). We were also able to provide packed lunches for all makers on the day – I’ve been behind stalls at a few other maker faires and it can sometimes be tough to get enough free time to pop out for a sandwich. The faire takes hundreds of man hours to organise each year and we all largely work on the faire around our “real” jobs (and other life commitments) so burnout is a big issue: we’re hoping to be able to pay our core team of organisers for their time, but this is currently dependant on our final income from ticket sales. We recruited around 20 volunteers to help out during the maker faire and the setup on the evening before. Recruitment was largely through word of mouth and reaching out to volunteers from previous years. Prospective volunteers filled out a form on the BMMF website with their details and we arranged shifts by contacting people via email and phone a few days before the event: around a third of the prospective volunteers who registered on the website ended up not being available nearer the time. Volunteer roles included manning the ticket desks, taking workshop bookings, delivering lunches and water refills to makers, manning the information desk and helping particularly busy makers with their stalls. Volunteers were usually working in teams of two so they could take it in turns to have a look round the faire when things weren’t too manic. In previous years we’ve had scheduled morning and afternoon volunteer shifts on the day, but this year the shifts ended up being largely ad hoc. As there was plenty of opportunity to have a look round and speak to makers a lot of volunteers ended up working through most of the event and then heading off when things got quieter towards the end of the day. Our event managers at the Brighton Dome have been great at suggesting ways to improve the faire logistically. A couple of years ago they asked us to set up a designated meeting point for lost children, so since then we’ve had a central information and meeting point in the main exhibition area signposted by an enormous light-up pointing finger hanging from the ceiling (no missing that). We also have two St Johns Ambulance first aiders present during the faire – luckily there haven’t been any major accidents, but there’s been a couple of times where we’ve been glad they were there to help out with medical issues. A set of radios and earpieces for the organisers are invaluable and also help us stay in touch with the venue staff for dealing with issues like medical problems and lost children. They save us a lot of running around and frantic phone calls trying to get hold of people. Following on from complaints in last year’s visitor survey that people with pre-booked tickets had to wait in long queues with people buying tickets on the day, we experimented with a new entry system this year where people with pre-booked tickets had a different entrance and ticket desk to allow them to get in quicker. This seemed to work well – there was less noticeable grumbling about queueing times anyway. And perhaps the most important thing we’ve learned is to know our limits – we knew after overcrowding issues last year that people don’t have a good time if there’s too much crammed into a small space, so this year we had a better idea about the maximum number of stalls we wanted to have in the exhibition space and decided to spread out more of our makers around other areas of the venue to free up some breathing room in the main area. The vibe this year was much more relaxed, and the main room stayed comfortably busy until much later on in the day as visitors were able to take their time to look around. 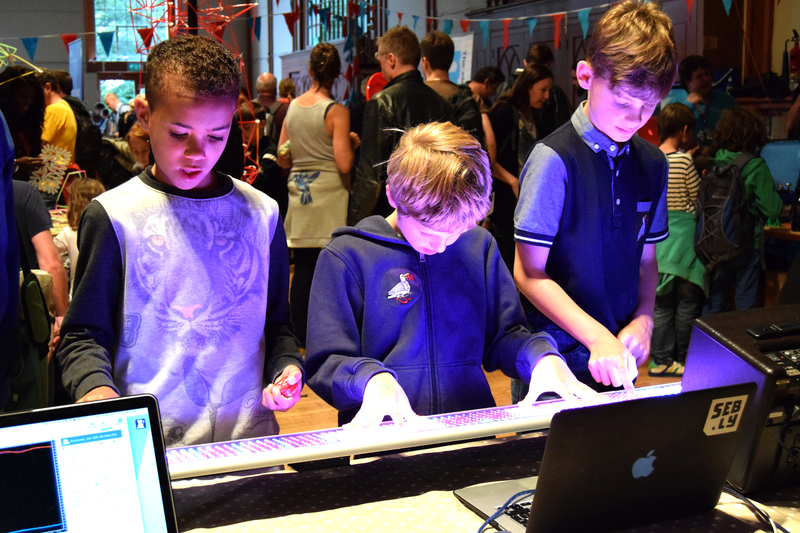 More photos from Brighton Mini Maker Faire 2015 are available on Flickr.